Semper Fidelis Chapter have been in good hands for the last year, with Kit Keefe leading in the capacity of first principal. Kit has just completed his third stint in the top chair at Semper Fidelis, having filled this office in a two-year period between 2010 and 2012. He has been ably supported over the last twelve months by Steven Carr and John Conroy. 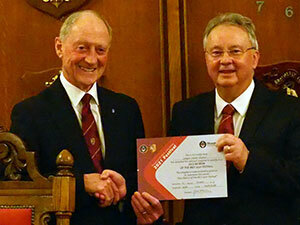 Barry Jameson (left) presents the MCF Vice Patron’s certificate to Steven Carr. The principal guest on this occasion was Barry Jameson Second Provincial Grand Principal. 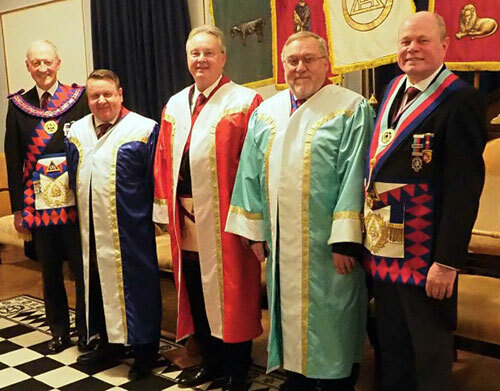 Barry was supported by Assistant to the Provincial Grand Principals Duncan Smith, South Fylde Group Vice Chairman John-Robbie Porter, grand officers Neil MacSymons and Raymond Firth along with acting Provincial officer James Hardman, with a good number of distinguished companions. It must also be recorded that Past Deputy Grand Superintendent Steven Reid was also in attendance and acting in his elected role as janitor. Steven was called in at one point to deliver an eloquent eulogy to the late Malcolm Hall, who had recently passed away. Steven re-entered later in the proceedings when the new janitor, Julian Hale, took post. Having been presented by director of ceremonies, Roger Walker, Steven Carr was installed as first principal by Kitt Keefe, in an exemplary manner. This is Steven’s second time in the first principal’s chair, having previously been installed in 2015. John Conroy was then installed as second principal followed by Derek Lewthwaite as third principal. Pictured, from left to right, are: Barry Jameson, John Conroy, Steven Carr, Derek Lewthwaite and Duncan Smith. The proceedings were enhanced by Rev Canon Godfrey Hirst, who delivered the prayers and the bible readings throughout the ceremony. These readings were from Genesis, Exodus, Leviticus, the first book of Samuel and Psalms. The robe addresses were performed as follows. Kit Keefe delivered the scarlet robe address to Steven Carr who then delivered the purple robe address to John Conroy, who finally delivered the blue robe address to Derek Lewthwaite. At the end of a fine ceremony, Barry Jameson extended greetings from Tony Harrison, the Grand Superintendent. Then Duncan Smith expressed greetings from the grand officers and congratulated the installation team on a job very well done. After several other words of congratulations the principal guests retired. With the final items of business swiftly completed the chapter was closed and the companions then sat down to a hearty meal at the festive board. At the end of the meal the usual toasts were honoured, and Godfrey Hirst sang the principal’s song with his customary verve and Steven Carr presented Kitt Keefe with his immediate past first principal’s jewel. Proceedings were then closed by Julian Hale who proposed the janitor’s toast. Pictured, from left to right, are: Dave Barr, Steven Reid, Raymond Firth, Barry Jameson, John Conroy, Steven Carr, Derek Lewthwaite, Duncan Smith, Neil MacSymons, John-Robbie Porter and Jim Hardman.